In this series, I will attempt to outline key issues facing policymakers as they meet in Paris at the UN’s Conference of the Parties-21 starting on November 30th and possibly culminating in a global climate treaty by the end of the conference on December 11th, called a “deadline” by the organizers. COP21 is being viewed as a last chance for humanity to seriously address climate change in concert and therefore face humanity’s most serious and ominous existential crisis. Human survival as a species may very well be at stake. It’s strange yet on the eve of COP21 in Paris, starting on November 30th, where humanity will try to save itself, that reasoned, careful analysis of previous such attempts have been heedlessly left to one side. The natural scientific backdrop of a deteriorating climate system will, it seems, not be translated into effective social and technological instruments. One would think that such instruments would most likely emerge from a systematic, transparent, public, reality-based effort to construct or locate best practices that actually reduce emissions, thereby making humanity’s best or a better effort to stabilize the climate and stave off potential human extinction. The first step in such a careful systematic effort would be, one might think, an inventory and analysis of what had already been tried by the same group that will meet in Paris, the UN Conference of the Parties, or by previous efforts to deal with energy and emissions in perhaps less climate-focused ways, as happened in the 1970’s in response to the oil and environmental crises of that era. But it appears as though no such evaluation will take place for perhaps a variety of reasons some of which can only be the object of speculation and surmise. The COP organizers have customarily provided themselves however with a neat way to evade the accusations of an intellectual monoculture by surrounding the event with “civil society” events and side-events that suggest a marketplace of ideas that will compete at the event. The civil society events that would have or will take place in the streets of Paris, have been now made less likely to happen in any dramatic fashion by the Daesh (ISIS) terrorist attacks and the French government’s legitimate security concerns surrounding the Congress. Even if they were able to take place in their full volume it will be highly unlikely without an incisive and clear set of demands, for the “colorful” or relatively diverse side-events or, civil society events, to have much of an impact in the “high church” of the main event. Without a reasoned analysis of what has gone before and what is likely to happen again, it appears as though the meta-strategy of “There is No Alternative” (TINA) is being played out, with in this case, the fate of all involved in the TINA gamesmanship hanging in the balance. No one will “win” if TINA is allowed to continue as the dominant theme in Paris and beyond. “There is No Alternative” is sometimes discussed in these pages (New Economic Perspectives) by Bill Black among others. One dimension of TINA is that it is an “assumptive” strategy on the part of ruling groups. An assumptive close, in sales, means that the salesperson talks as if the deal is already sealed or the buyer already wants to agree to the offered terms or product. The assumptive element of the TINA strategy is that no explicit discussion is required of the options available to policymakers or the public at large. TINA however does not only play out in discourse but also in physical reality: “ignoring” alternatives may involve in some historical situations, military coups d’état, counterinsurgencies or political “dirty tricks” (Bush operatives in Florida 2000), a strategy of actively suppressing or undermining competing alternatives. However elites exercising a TINA strategy are in a more secure position if they can simply assert, from lofty positions in institutions or in the media, a “scientific” or “commonsensical” path that is never fully subjected to rational, empirical or electoral test. The TINA alternative is treated as established fact via these assertions and passive assent by those who do not know or who do not care enough that there are alternatives. Activists, some of whom consider themselves critical of the UNFCCC (United Nations Framework Convention on Climate Change) process and/or are radicals of various types, are, it seems, mostly caught up in the TINA meta-strategy as regards climate action alternatives. As will be discussed in subsequent installments, many activists and COP parties critical of the UN process so far, see the major problem as a matter of inequality of climate policy outcomes rather than their effectiveness in cutting emissions or they have written and acted as if equal distribution is a substitute for the effectiveness dimension. Few have come together with an alternative proposal that would provide the basis for a different international or, for that matter, national climate policy architecture that would be actually effective in reducing emissions to near zero. Some predict a failure of the COP21 process as if this confirms their pre-existing beliefs about the corruptness of elites. On the other hand, many are hoping that elites at COP21 unite and make a “global deal” without providing much direction to those elites. There is a general wish for there to be a solution to the climate crisis as well as a host of other social demands. Everybody believes that emissions need to be cut but have not settled on how this is going to happen. Even if policy elites or fossil-fuel dependent transnational corporations around COP21 and the UN, favor a “TINA” metastrategy it is not in their best interests as human beings to pursue such a strategy. To foreclose an evaluation of what has gone before and to shut out potentially effective options is to consign oneself, one’s children and grandchildren to a world of suffering and pain. Extinction of our species looms as a possibility, if we cannot rein in our fossil fuel use, destruction of natural carbon sinks and simultaneously devise new net-zero carbon emitting ways to maintain humanity and human civilizations upon this earth. I will attempt in this installment to clear the fog generated by the muddled climate discourse by as clearly and succinctly as possible, analyzing the effectiveness or ineffectiveness of the current dominant climate policy framework. Were emissions cut because of Kyoto or other UNFCCC mechanisms? Were emissions cut quickly and dramatically enough to help stabilize the climate? Was social welfare maintained or enhanced while emissions were cut? The parties involved in the Kyoto process as well as the UNFCCC process as a whole took in the 1990’s the now, from the point of view of current climate science, unsatisfactory goal of reducing global emissions to 20% of 1990 emissions by 2050. Thus if these efforts were successful in its own terms it would allow warming emissions that will push the globe over the 2 degree Celsius over pre-industrial average temperature mark that is considered dangerous. The maximum 2 degree warming target, at the same time, is very “generous” to carbon emitters in the current generation and is itself unsatisfactory. The warming of the climate should be halted before we reach 2 degrees if at all possible, as we are seeing now some of the effects of runaway warming at approximately 0.6 Celsius warming currently (compounded by a strong El Nino). Some are calling, realistically in terms of preventing damages to the co-evolved biosphere, a 1.5 Degree maximum warming target. Formulated in the mid 1990’s as the first attempts to address the seemingly distant threat of climate change, it is understandable that at that time many would endorse the target of cutting global greenhouse gas emissions by 80% over 50 years time. Most of the publics of various nations had not yet experienced much in the way of the effects of climate change; it had the appearance of just another good, “environmental” cause championed by the UN. The political pressure for action originated mostly from climate scientists and those environmental activists, political leaders, and writers that had grasped the implications of climate science. Times however have changed, including the installation of Kyoto-related institutions and processes as a climate bureaucracy with unambitious goals that may function as a block or drag on more ambitious and effective policy frameworks. We are in a full-scale, global climate emergency. The signature of human-caused global warming and a future warming trend is now obvious in many locations around the globe as well as in the measurement of air & water temperatures, ocean acidification, and atmospheric concentrations of carbon dioxide and methane. Even if emissions were to plummet to 20% of 1990 emissions within a year (almost impossible) and then stay level until 2050, there would still be too much in the way of warming potential in the global climate system, as overall concentrations of greenhouse gases, now at 400 ppm, would climb towards 450 ppm and beyond. We now know the half-life of carbon dioxide in the atmosphere to be in the hundreds of years and the warming potential of much recently emitted as well as historically emitted carbon has not yet been completely felt. Below 350ppm carbon dioxide equivalent is considered safe for the Holocene climate and is only within reach with a net zero emissions outcome plus the fixing of a great deal of atmospheric carbon. The UN’s IPCC AR5 report downplays foreseeable non-linear effects of continued warming and warming emissions that could quickly lead to disastrous levels of warming in the not too distant future. A reassessment of targets is then in order, where within a few decades the entire global economy would need to achieve net zero and even negative emissions (by fixing carbon out of the atmosphere). This is not a matter of unrealistic efforts to achieve moral purity but simply a matter of physics. If the occasion for the convening of the UNFCCC has been the findings of geophysicists, those findings must remain relevant to and interact with the processes of the UNFCCC institutions as they continue to develop. So to re-adopt or continue the Kyoto process with the assumption that the 80% of 1990 emissions by 2050 is the proper goal, is out of touch with our geophysical reality, which is the rationale for engaging in climate policy in the first place. The 20% by 2050 target was not arrived at by any scientific process but was more of, at the time, an ambitious-sounding goal that would allow for some fossil fuel use even at 2050 and beyond. At that time, the technologies that would enable a net-zero emitting society were considered to be too expensive and had, in the view of that time, too many limitations to enable a rapid cutting of emissions. The 80% of 1990 emissions by 2050 idea was that some uses for fossil energy would be needed in 2050 and some developing nations would still be morally entitled to pollute at that date in the future, as more developed nations had been able to historically pollute and warm the atmosphere in order to achieve their levels of development. Also the chosen timeline suggests a gradual descent in carbon emissions, allowing for a long period of experimentation in social and technological models to enable reduced emissions with economic benefits, as understood by mainstream economics. The 20% of 1990 emissions by 2050 targeting also gave plenty of room for postponement of action by big polluting industries and high-per-capita polluting nations, as well as a continued lease on life for the fossil fuel industries. The Kyoto Process, in fact, encouraged displacement of emissions cuts to where it was more “cost-effective” and also that seemed to be designed to, in part, serve the worthy development goals of the UNDP, the UN development program. Combining goals of the UNEP/UNFCCC with the UNDP may have seemed at the time, ideal from the point of view of satisfying multiple worthy intentions and constituencies represented at and by the UN, even though this mixing of motives may have created some of the more corrupt aspects of the Kyoto process, in particular carbon offsets. But corrupt or not, or designed according to a realistic understanding of the economics of energy and land use, or not, the primary test of Kyoto would have to be whether its programs and mechanisms can cut emissions while maintaining or enhancing social welfare. Its advocates claim that it is a “starter” policy that can be turned into other policies down the line. Does this assertion hold up? Is Kyoto at all effective even within a more limited end goal target? Any assessment of Kyoto should start there, even if we should also recognize its goals as inadequate and too slow for our current dire climate circumstances. While in the 1990’s this was not so simple to do, it is now fairly easy to analyze at least the correlation between carbon emissions levels and the institution of Kyoto-related programs in various nations. 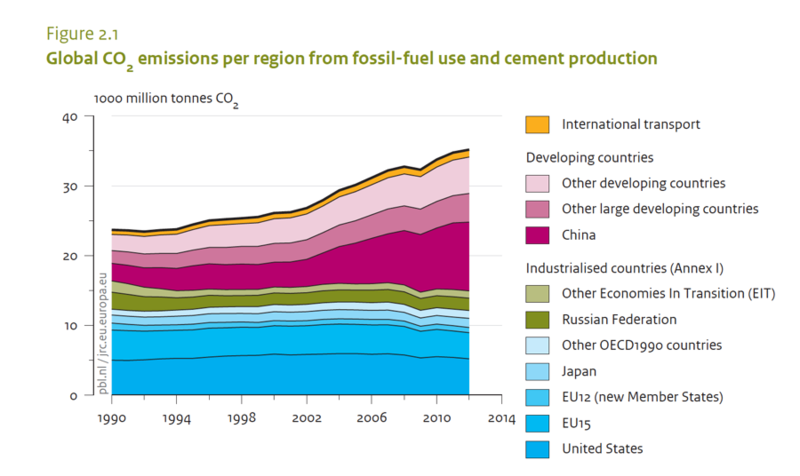 Most nations and the World Bank, as well as a number of international NGO’s have created carbon emissions inventories of varying detail that span almost all nations and provide fairly reliable estimates these emissions for most years within the critical period of 1990 to the present day. Did Kyoto Mechanisms Cut Emissions (at All)? 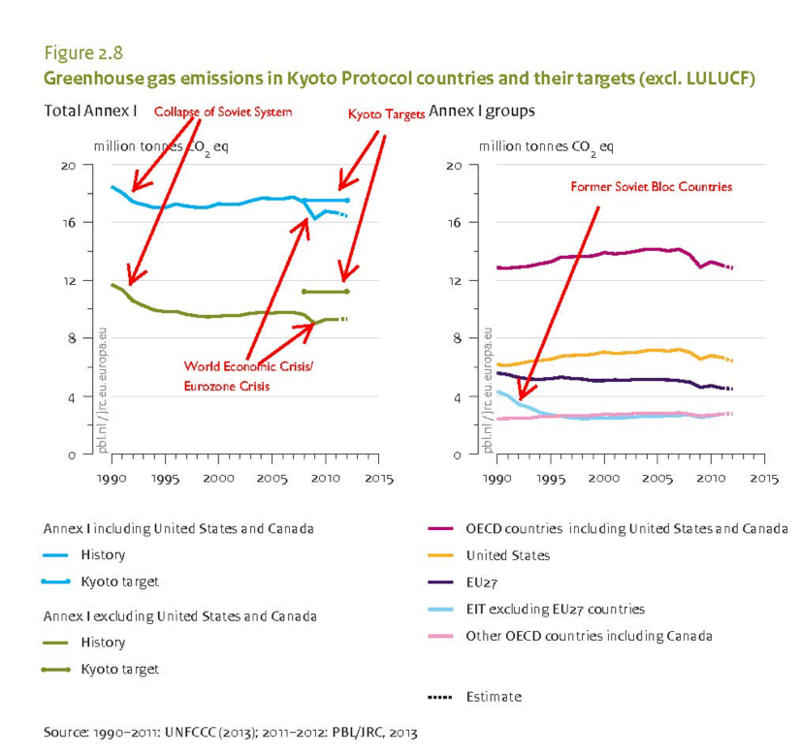 In the first commitment period (2006-2012) the unambitious Kyoto targets (-4.2% from a base year usually 1990) were met in the Annex I countries as a whole, even though it is equally clear that the central Kyoto mechanism, emissions trading, had almost nothing to do with any significant emissions reductions. In tracing the emissions trajectories of the Annex I countries (Western and Eastern European countries, Japan, US, Canada, Australia, Russia) periods of year-over-year reduction in emissions relative to 1990 have most to do with the collapse of the Soviet industrial system, efforts at climate-friendly national energy policies on a national level in some nations, deindustrialization of these countries relative to China and other developing countries, and the global economic crisis of 2008 and subsequent Eurozone crisis. The central emissions trading mechanism, the EU-ETS, has been plagued with an abundance of low-cost permits, meaning little incentive for polluting industries to cut their emissions due to the emissions trading scheme. The Kyoto process, for a number of reasons, has not been a worldwide solution to containing, let alone reducing emissions. 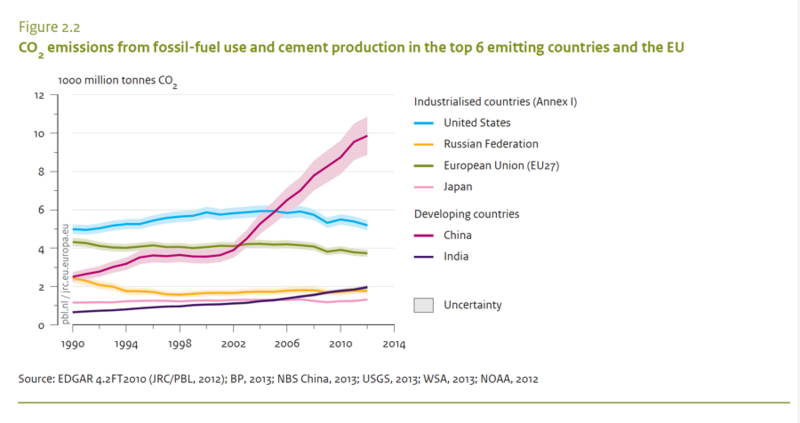 The overall trend in emissions for the world is up as China and other parts of the developing world industrialize, develop, as well as raise living standards among a growing middle and upper class. One of the primary fuels for this development is coal, helping push up emissions. The deindustrialization of many portions of Europe and North America have adjusted in lock-step with the rise of industry in China and elsewhere, with a portion of China’s emissions attributable to consumption outside China, the result of its export-led development model. The failures of the Kyoto process, as both a regional mechanism to transition to a low carbon economy and world-wide cap on emissions, can be placed into three categories: intended, unintended and “semi-intended”. Intended/Multipurpose – the Kyoto Protocol and its central emissions trading instrument have always been explicitly “sold” to the public and national governments as a means to postpone serious emissions cutting until such time as it was “easy” or “easier”. The value placed on trading as the end product of the emissions cutting process as well as “cost-effective” emissions cutting immediately placed market-making and first cost considerations on par with if not above the duty to cut emissions in one’s own organization be that a government, business or household. So the failure of some of the major polluting industries as well as high consuming nations (if imported emissions are included) is built into the Kyoto architecture. Also intended was the displacement of economic activity to the developing world, i.e. to cause development there as a secondary or even primary goal. There have been criticisms of the type of development that Kyoto has driven in those countries as well as types of development which were not stimulated by the Kyoto mechanisms, including carbon offsetting and REDD+. Furthermore a more lax standard of emissions was granted those developing countries, even as sustainable development has been held up as a goal, with the sustainability of actual development there often called into question. The mixing of intentions thus ended up placing priority upon one or the other intention. Unintended – The primary reason that Kyoto defenders make regarding the Kyoto mechanisms’ failures is that key polluting nations (notably the US and Canada) failed to ratify the Kyoto treaty and then make substantive commitments under that treaty. Furthermore, Kyoto advocates believe that bringing China and India into Kyoto-like carbon trading regimes would make it more likely that the Kyoto system would work. Clearly Kyoto advocates have wanted the whole world to join together under the (flawed) Kyoto concept. Also as above, they did not intend that China become the “workshop of the world” fueled by coal, even though such an outcome was not beyond the realm of possibility. “Semi-intended” – The Kyoto protocol is built upon misguided notions about the role of trading and financial markets in real economies. Once adopting the flawed understandings of real economies contained in neoclassical/neoliberal economics, the Kyoto planners then intended and still intend to erect emissions trading schemes laboring under these misconceptions about their effects. The trading schemes with their own bureaucracies then become elaborate distractions from actual emissions cutting activities. The inhabitants of these bureaucracies believe that they are doing something beneficial for the climate but the structures in which they operate, for the most part, work against the expeditious reduction of emissions to zero, that we now require, or even appreciable reductions to, for instance 20% of 1990 emissions levels. The role of intentions is critically important as building a net-zero carbon emissions society will be an act of realizing human intentions, be they directly via government programs or indirectly by persuasive (including monetary) policy instruments. What is being discussed in ongoing climate negotiations pre-COP21 and beyond are Intended Nationally Determined Contributions (INDC’s), i.e. what nations will commit to cutting in the way of emissions. A policy framework that mutes, twists or suppresses human intentions to build such social arrangements will be doomed to failure. The role of carbon permit trading and the creation of markets to trade such permits as a the chief means to spur emissions cuts could only be conceived as a rational or potentially effective policy to change economies in an era that has fully misunderstood how the “real economy” changes under non-climate related circumstances. The architects of the Kyoto system did not invent the otherworldly, unrealistic economic “commonsense” from which they drew their assumptions: the planners and negotiators simply built those popular but non-functional economic ideas into the world’s most critical set of economic and environmental policies, i.e. climate policy. Just as carbon trading is considered the default climate policy for no rational reason, so too in mainstream neoclassical economics are markets treated as “natural facts” and the “natural” basis of the economy itself. The repetition of the words “markets” in discussions of economics more generally as a representation of the economy as a whole is not a harmless simplification but a civilization-destroying practice that has had its subtle and not-so-subtle effects. Markets are embedded in the larger society and government institutions and are dependent on these for their existence and growth. That markets are assumed to be the foundation of civilization and the economy has been the cause of a number of ongoing economic disasters in a wide variety of societies and now, without too much dramatization, threatens to end the very existence of human societies. Most of the revolutionary changes in the economy of the last century and a half have either been initiated or strongly “co-engineered” by government interventions into the economy as well as the work of large, vertically-integrated corporations that are partly insulated from market pressures by some combination of their size, monopolistic position, and by government favors and protections. That governments are not market forces and subject to markets or that large corporations are protected or able to protect themselves from market forces is not necessarily a bad thing, contrary to the supposed wisdom of conventional economics and its political outgrowths such as the misguided libertarian and neoliberal political philosophies. If a private company is operating in the ideally efficient market, it will tend to postpone or never make long-term investments in real assets, like factories or energy generation facilities. Financial markets and “marketization” of large non-financial corporations have tended to discourage long-term investment in real assets and instead encouraged investment only in “paper” financial assets. While you wouldn’t know it listening to the second-hand market idealizations that reverberate in climate policy circles, markets are not the source of “all good” or all efficiencies in the economy, contrary to the mantras of economists who have not studied real economies empirically and have been drilled in neoclassical economics’s unrealistic catechism. Economists ideas about the roles of markets, inculcated by the unrealistic and fairly useless economics curriculum in most universities, are abstractions that is imposed upon a real economy that escapes their particular attempts at analysis or, more likely, their non-empirical (and not particularly sophisticated) mathematical “modeling”. Particularly in the areas of transportation, land use, and energy, where climate policy will have its greatest effects, the notion that these portions of the economy are “market-based” or should be “market-based” is to fully misunderstand what markets are and of what these sectors of the real economy consist. Of course, some markets exist within these sectors of the economy but they are heavily dependent on the historical legacy of government and private-monopoly infrastructure building as well as decades and centuries of government regulatory decisions (nor should “unleashing” them necessarily yield social or environmental good). Roads, trains, and electrical power systems are the product of either government planning or the large scale planning of corporate monopolies and quasi-monopolies that, in modern economies, are more or less regulated and subsidized by governments. That these installations generate revenue for private entities and deliver use-fees to public entities is not an indication that their shape and structure was drawn by “the hand of the market”. Those success stories where a nation has cut its carbon emissions substantially over the past 4 decades via intentional acts (rather than unintended economic depressions or deindustrialization) have involved substantial non-market, non-Kyoto-based government investment and regulation. Denmark, Sweden, France and Germany have all from 1970 on, cut their per capita emissions by a variety of strategies, many of which pre-date their Kyoto-oriented climate programs. There are virtually no other mechanisms for maintaining living standards, while intentionally cutting emissions per capita, other than utilizing government tools directly. The Kyoto system is structured by an economic “cosmology” that assumes that government is largely invisible or simply a “cap-setter” and auctioneer and then stands back and lets the invented carbon permit trading and offset trading markets allegedly cut carbon emissions. We have just seen above that this approach is ineffective in cutting carbon emissions and therefore inadequate to the task at hand. It is also based on myths about the normal functioning of real economies that are often repeated by the naive but are ideas that are largely misleading and destructive of human well-being under a wide variety of circumstances. Within the current economic cosmology in which Kyoto-oriented economists and policymakers operate, it is nearly impossible to “think about” and discuss direct interventions into the energy, transport and land use economies by governments. Within the same cosmology, it is also nearly impossible to think about the abundant self-funding mechanisms that national governments have, most notably their issuance and maintenance of a national currency (with the exception of the Eurozone countries that are incredibly influential within the UN). Instead governments are supposed to facilitate, according to these misguided advisors and bureaucrats, the formation of new markets and the packaging of carbon-related projects or “project ideas” as tradable assets for consumption by private finance-driven trading markets. The Kyoto economic cosmology is entirely at odds with both historical examples of nations cutting their emissions substantially and the real terrain and technological solutions which will yield the most carbon emissions reductions in the least amount of time. In the face of our current worldwide climate emergency, the insistence on sustaining the Kyoto economic framework is a tragic folie à plusieurs, a madness shared and reinforced by a large group. The fiscal and creative powers of government to maintain social welfare, economic liquidity, and to build new, in the case of the climate emergency, public infrastructure that would enable the transition to a net zero emitting society. The full set of regulatory instruments of government that must redirect economic activity via the strongest of means and must in certain areas regulate or prohibit excesses that will doom a habitable planet. I will show in the next installment in this series how a new international framework can facilitate rather than block or misuse, the many well-intentioned efforts by national and local communities to stanch our carbon emissions, sustain and develop a better civilization, and rescue our species from possible extinction. This entry was posted in Michael Hoexter and tagged climate, climate policy, COP21, environment. Bookmark the permalink. What the thorough analysis of ‘Kyoto’ above demonstrates quite convincingly (and subsequent looks at the ‘follow-on’ run-ups to COP21 will only confirm) is the ultimate futility of trying to respond remedially to what are after-all entirely biological Conditions relying on the ideological motivations and institutional mechanisms that have been so preternaturally effective in bringing about these same terminal-stage Conditions to begin with. Attempting to address this dire “self”-inflicted predicament with more of the same old magical thinking and make-believe “civilized” conceits will only result in the “extinction” already threatening the domesticated peoples….and ‘prove’ they aren’t ‘fit’ to survive (as a virtual ‘component’ of Earth’s Whole Living Arrangement), anyhow. If this stark Natural Fact isn’t the entire sum and substance of what gets ‘talked-about’ in Paris, everybody involved might just as well stay home….and kiss their own and each others’ asses “Goodbye!” This is not “a test,” tame Sisters and Brothers. This is the ACTUAL EMERGENCY.